This tutorial will demonstrate how to use ShaderMap 3 to create two displacement maps from a single source image. 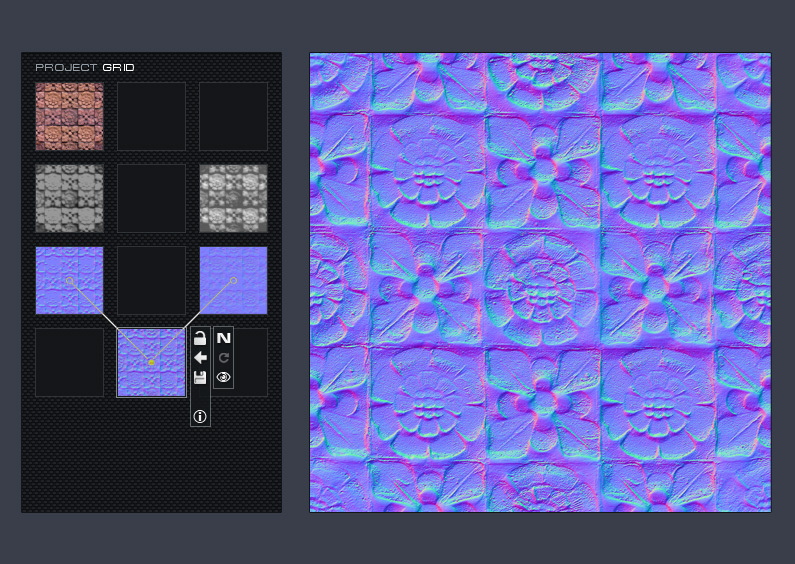 The displacement maps will then be used to generate two unique tangent space normal maps. Finally, the normal maps will be combined to create a single normal map. Using this method will give additional controls, such as fine-tuning high and low detail, over the normal map generation process. From the ShaderMap Start Screen, click the Advanced Button found in the bottom right of the window. 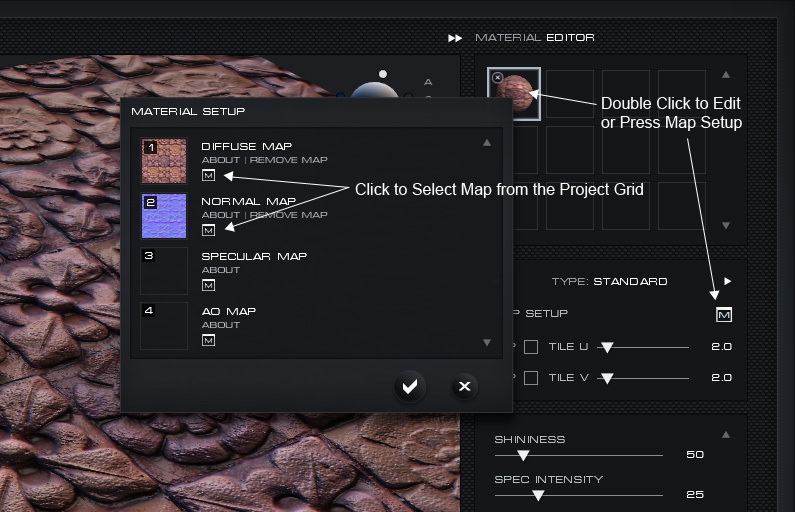 This will allow you to create an empty ShaderMap project. 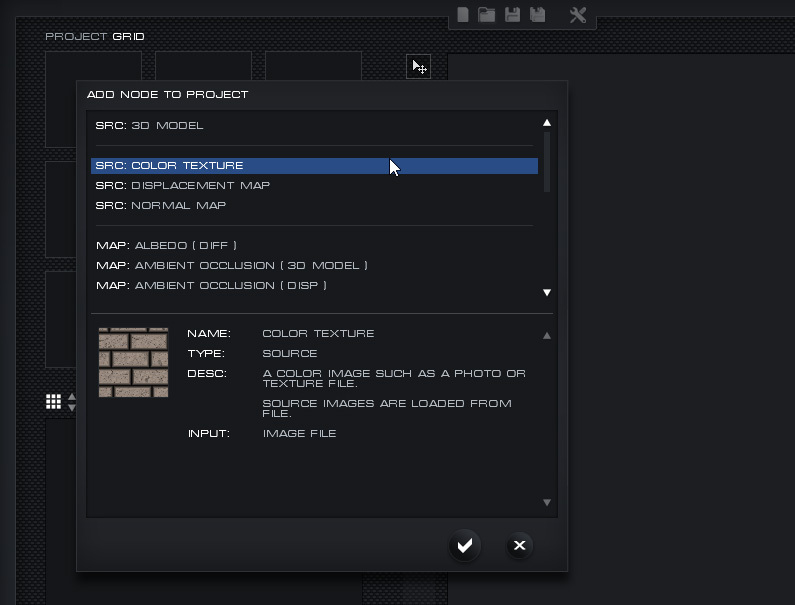 There will be no maps in the project grid and no materials in the Visualizer. These will need to be setup manually. As soon as the new (empty) project page is shown, the “Add Node to Project” dialog will appear. Double-click the item "Src: Color Texture" from the list. This will bring up an Explorer window where you can navigate to your color source image file. 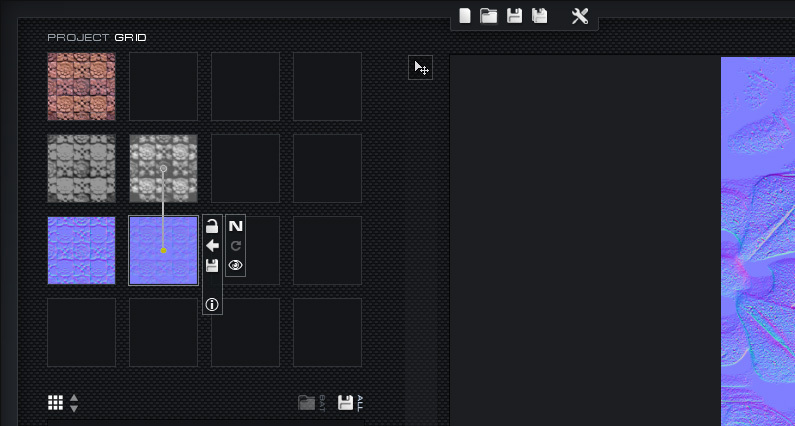 Once the color image is loaded it will be added to the Project Grid. Next set the map properties to match the following. This is important because we need to tell ShaderMap that this color image is tileable (seamless) on both X and Y coordinates. Setting the High Clip Plane to 60% will ensure that any pixels brighter than 60% of white are clipped to 60% gray. 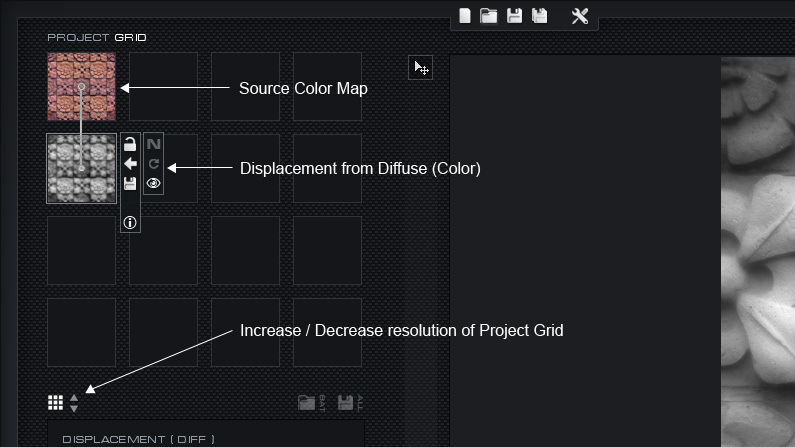 Now create a clone of the first displacement map by left-mouse-and-dragging the displacement map thumbnail on the Project Grid. While dragging the displacement map press and hold the SHIFT key, you are now in clone mode. Drag the thumbnail over an empty cell and, while still holding the SHIFT key, release the map by letting go of the left mouse button. Setting the Low Clip Plane to 35% will ensure that any pixels darker than 35% of white are clipped to 35% gray. Add a new map to the Project Grid using the same method used in Step 3. This time add the map "Map: Normal [Disp]". This map creates a tangent space normal map from a displacement map input. Select the new normal map and ensure that its input control is placed on the first displacement map and not the second cloned map. As an exercise, try to move the map’s input back and forth from the first and second displacement map (left-mouse-and-drag to change the input map). We now have the final normal map. By changing the lower pixels in the first displacement map you can alter the final normal map, the same goes for the higher detail displacement map and normal map. Play around with the settings but first we should setup the Material Visualizer so we can see the results rendered in 3D. Press M on the keyboard to bring up the Material Visualizer. M is a keyboard shortcut which toggles between the Node Preview and the Material Visualizer. Next ensure the Material Editor is visible by clicking the double arrow on the top right side of the Visualizer window (it may already be out). Move your mouse over an empty material cell in the editor and, just like in the Project Grid, click the plus (+) button that appears. Select “Standard Material” from the drop list. Next setup the Material maps so that it is using the original source image for Diffuse Map and the blended Normal Map. Left-mouse-drag the material on to one of the default geometry types in the main visualizer window to see it applied. Note: This older project file will use legacy map plugins when loaded with SM4 and up.